Activity Description: The Beta Phi Chapter started our week of events with gardening at the student garden of Motivate our Minds. We prepared the different areas for planting by removing withered plants, cleaning and tilling soil. Activity Description: Beta Phi hosted an elegant award show with categories ranging from “most influential,” to “best couple.” Attendees were entertained with a variety of talented acts. The AKAdemy Awards highlighted the various achievements and positive attributes of Ball State Students. This encouraged students to strive for edification in every facet of life. Admission into the awards show was one canned good to be delivered to Second Harvest Food Bank of Muncie, Indiana. Activity Description: This self-esteem panel encouraged emotional health. The panel encompassed professional speakers along with an open forum for students to voice their concerns. The topics ranged from self-esteem’s effect on inner beauty, faith and other’s perception of a person. 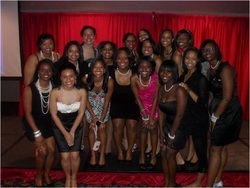 Activity Description: Beta Phi hosted collection tables at two locations on BOTH April 28, 2011 and April 29, 2011. The plethora of school supplies collected were donated to Bench Mark Family Services, a facility that provides out-home care for children. 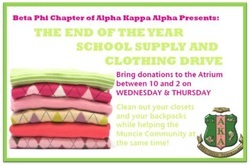 The large amount of clothing was donated to a Better Way of Muncie. A Better Way is a non-for-profit agency that provides shelter and service for victims of domestic violence. 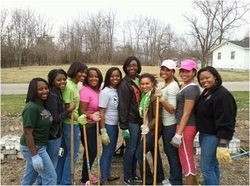 Alpha Kappa Alpha Sorority, Inc. is not responsible for regulating the contents of this website. It is the duty of the Beta Phi Chapter and all who manage this site.